October 26, 2015 By This post may contain affiliate links. These deep dark decadently rich Flourless Chocolate Cake Halloween Cats will make adults forget that they are too old to collect candy on Halloween. Who needs a candy bar, when you can enjoy a lusciously creamy chocolate cake that’s been infused with a rich brewed coffee? This post is sponsored by SharkNinja. 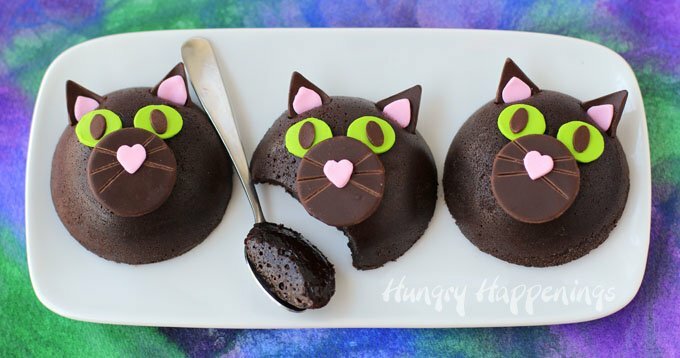 If you are hosting a Halloween party and want a dessert to serve that is whimsical and fun, yet has an amazingly grown-up flavor, these black cat cakes are purr-fect. These flourless chocolate cakes are so creamy, much like a cheesecake, and have an intense chocolate flavor that is enhanced by a shot of richly flavored coffee. I needed a deep dark fully flavored coffee for my recipe and had just the right machine in which to make that perfectly brewed cup of coffee. Last week a new Ninja Coffee Bar arrived at my doorstep just in time for me to make these cat cakes for my Halloween party. This new coffee machine has several settings to make the perfect cup of coffee-house-style coffee including a rich brew. 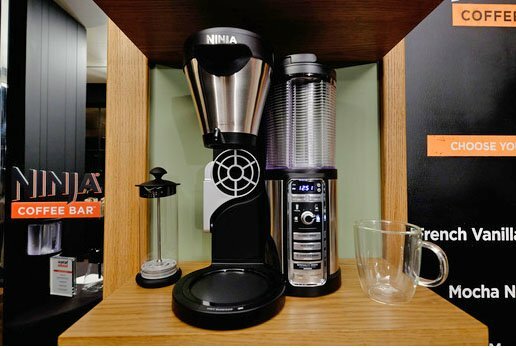 A few weeks before my machine arrived, I was flown to New York city to attend the launch of SharkNinja’s newest and most innovative coffee machine to date, the Ninja Coffee Bar. A group of bloggers and reporters gathered together at the Andaz Hotel, to see this beautifully sleek, modern looking machine in action. I was really impressed with the ease of use of the machine, but even more so by it’s attractiveness. It would definitely be something I’d happily showcase on my kitchen counter and not want to hide away in the pantry. At the event, everyone enjoyed specialty coffee house style drinks before the Ninja Coffee Bar’s vibrantly funny, stunningly beautiful, spokesperson took the floor. Yes, that’s Sofia Vergara, star of Modern Family. She’s a native Colombian and knows her coffee. Her passion for great coffee and her enthusiasm was really evident at the event. With wit and wisdom, she demonstrated how to easily make an iced coffee drink using the Coffee Bar. Her down to earth personality and charm really came through and it made me yearn to spend an afternoon with her in her kitchen just talking girl talk and making treats using coffee made in the Coffee Bar. I’ve been star struck before, like the time I yelled out “I love you Steve” to Steve Zahn as he walked passed me at an airport, before I froze like a deer in headlights. But, Sofia, just made me feel like I was greeting a friend. She wrapped her very delicate arm around my waist and I felt at home as the camera snapped our picture. I have been compensated by Ninja to create this recipe and share my experience with using the new Ninja Coffee Bar. All the opinions I’ve expressed here are my own. 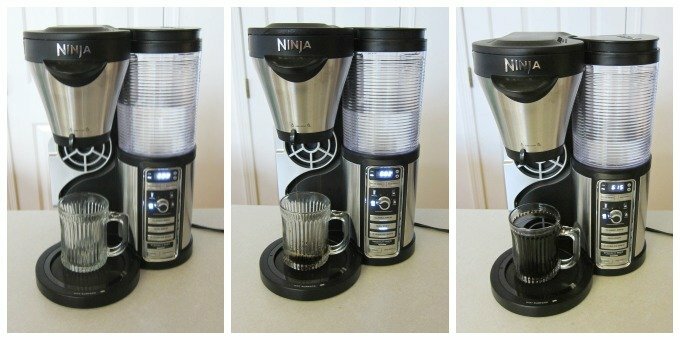 For more information about the Ninja Coffee Bar brewer and additional SharkNinja products, please visit www.ninjacoffeebar.com; you can also learn more at Facebook.com/NinjaCoffeeBar and @NinjaCoffeeBar on Twitter. 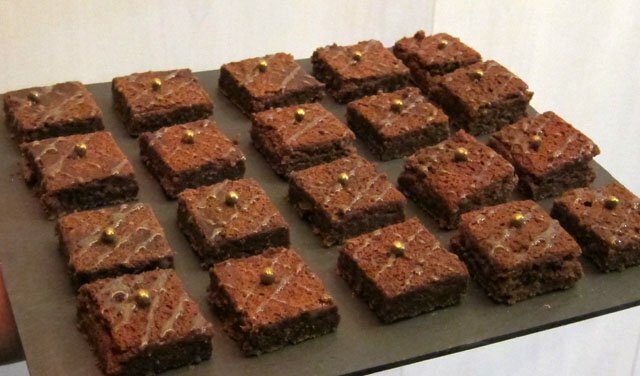 After the meet and greet with Sofia, we enjoyed some coffee flavored desserts including these decadent mocha brownies. My mind started racing with more recipe ideas. I knew these flourless chocolate cakes were in my future. I thought they’d make a wonderful dessert to serve at our Halloween party, so I just had to decorate them. I used modeling chocolate decorations to turn my cakes into black cats. They looked amazing on our dessert table. More on that later. Decadently rich, smooth and creamy, flourless chocolate cakes decorated like spooky black cats for Halloween. Set water bath in oven to heat up. Butter 18 half sphere cavities in 3 silicone mold with butter. Pour coffee over chocolate and butter. Heat in microwave on high power for 20-30 second increments, stirring after each until melted. Whisk eggs until they double in volume. Fold 1/3 of the eggs into the chocolate. Fold remaining eggs into the chocolate. Equally divide among the 18 half sphere cavities in the silicone molds. Bake for 9-12 minutes in a water bath until an internal temperature of 140-145 degrees is reached. Cool at room temperature for 30 minutes. Attach them to the cakes using piping gel. Cut 2 slits in the cake then insert the two ears. Recipe is adapted from Cooks Illustrated. Before you get your recipe together, you are going to need to preheat the oven to 325 degrees and set a roasting pan in the oven filled with enough water to go halfway up the sides of a silicone half sphere mold. More details are listed below. The new Ninja Coffee Bar is so easy to use. Just fill a reservoir with water, add your coffee grounds to the filter, set a coffee mug, travel mug, or carafe, under the spout, and press the button to make the coffee drink you prefer. I pressed the rich brew button to get an intensely flavored coffee. It was as simple as that. The water heated up, a few drops of coffee streamed from the machine, then before I knew it, the cup was filled. Now to use that coffee in the cake batter, just pour it over the finely chopped chocolate and butter in a microwave safe bowl. Heat bowl in microwave on high power for 20-30 second increments, stirring after each, until melted. Alternatively, you can melt this in a double boiler set over low heat. Make sure the chocolate reaches 115 degrees Fahrenheit. Meanwhile, whisk the eggs until they double in volume. Using a mixer will keep your arm from falling off, but it’s up to you how you’d like to get this job done. Stir one third of the eggs into the melted chocolate to loosen the chocolate. Fold in the remaining eggs. 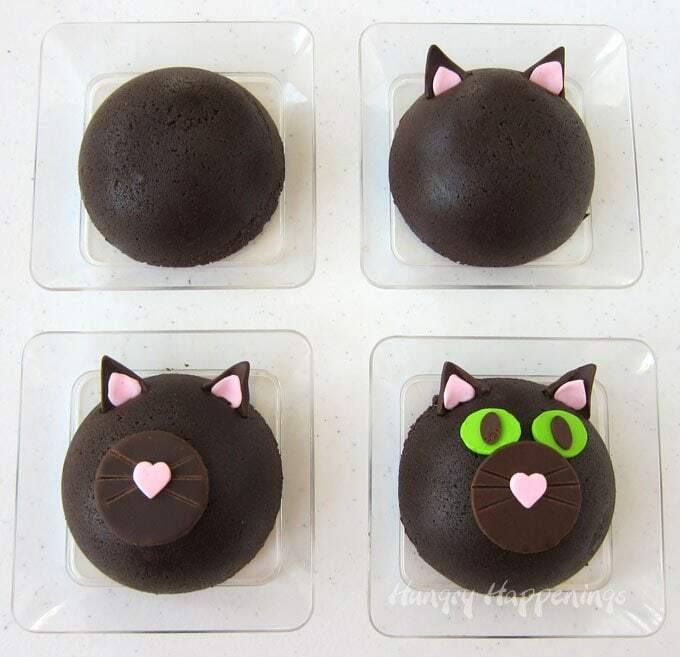 To get nice domed cakes to make your cats, you’ll need to use 3 silicone molds with 6 half sphere cavities. Butter the inside of the mold then equally divide the cake batter among them, filling them about 3/4 full. 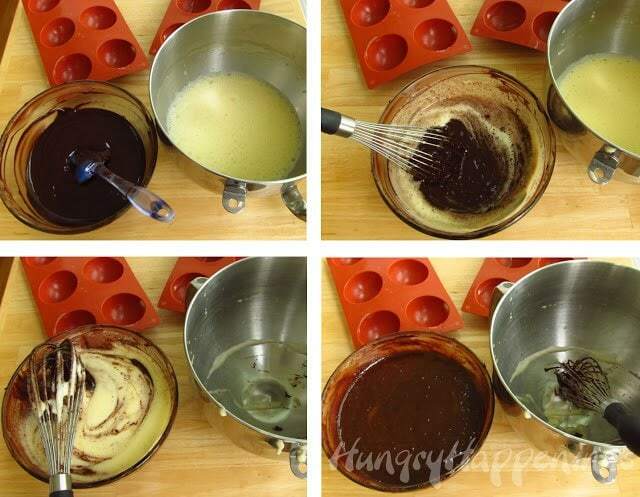 NOTE: It is best to bake your cakes in a water bath so that they will bake evenly and be creamy and smooth. I found it easiest to use a roasting pan with a removable rack for this job. Set one mold on the rack, fill it with batter then lower it into the water bath making sure no water sloshes into the cakes. Bake the cakes for 9-12 minutes until the cakes still looks moist and giggle a bit but are beginning to set and reach an internal temperature of 140 – 145 degrees Fahrenheit. Remove the rack and set the mold on a cooling rack. Then repeat the process. Allow he cakes to cool at room temperature for at least 30 minutes, then wrap in plastic wrap and refrigerate for at least 3 hours. Before you want to remove them from the molds, pop them in the freezer for 30 minutes so they become really firm. To un-mold the cakes, turn the silicone mold upside down and press the cakes out. 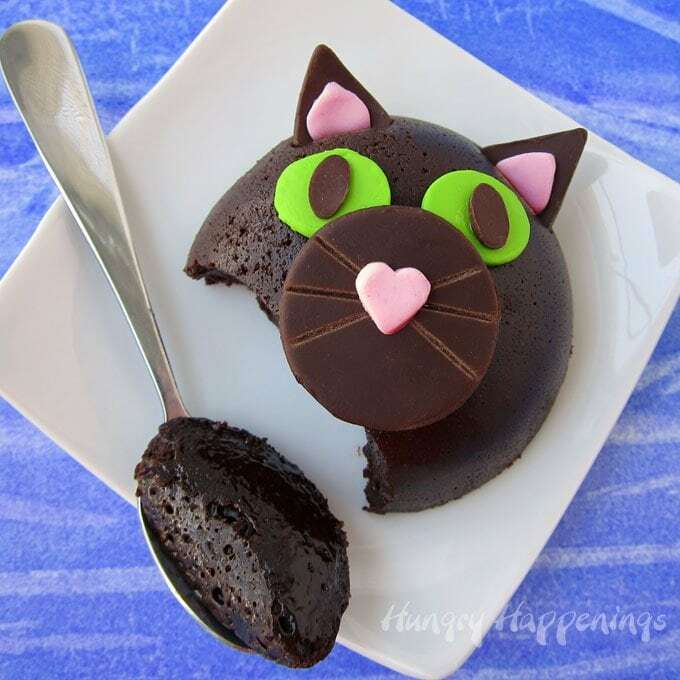 If you are serving these for Halloween and want to make them look like spooky black cats, you need to decorate them using modeling chocolate, preferably, or fondant. You can find the recipe to make the simple 2 ingredient modeling chocolate on my Chocolate Making Tips page. There are also tutorials on coloring and working with the modeling chocolate. You’ll need chocolate brown, pink, and green colored modeling chocolate to make these black Halloween cats. Roll out your chocolate brown, pink, and green modeling chocolate very thin on a silicone mat using a fondant roller. If it sticks at all, you can lightly dust the work surface and rolling pin with powdered sugar. 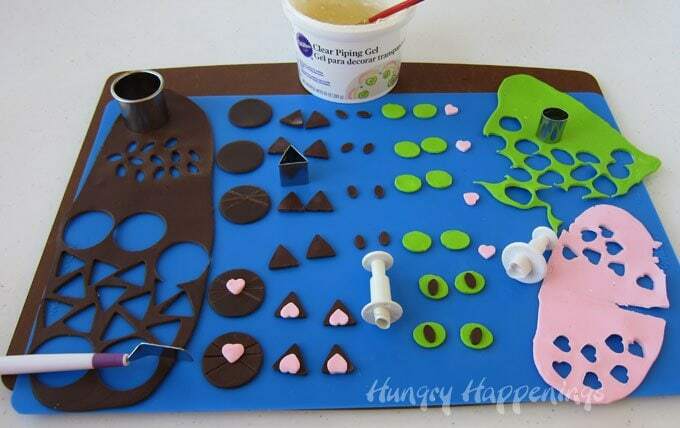 Then use small cookie cutters, fondant cutters, or plunger cutters to create the cat’s features. To add whiskers to the snout, make an indentation in the center of a circle about 1/3rd of the way from the top. Use a knife or metal spatula to indent lines going across the center, creating 3 whiskers on each side. Be careful you don’t cut all the way through. Use small dabs of piping gel or water to attach the pink heart nose to the snout, the pink hearts to the chocolate ears, and the pupils to the eyes. Use piping gel to attach the cat’s features to the cakes. Just brush a small amount on the back of the snout and eyes and press them onto the cakes. If you don’t have piping gel, you an use a small dab of Nutella or chocolate frosting. To attach the ears, cut small slits in the cake and insert the ears into the cakes. Keep your cakes refrigerated until shortly before serving. They are best if allowed to warm up a bit at room temperature, so pull them out at least 20 minutes before serving. They’ll go great with a big mug of hot coffee. TIPS: To keep condensation from forming on the modeling chocolate, I like to set my cakes on their serving dishes or individual dessert plates, set them in a baking pan, drape a piece of paper towel over top so it doesn’t touch the cakes, then wrap in tin foil. I’ve even frozen these cakes like this before. I remove them the day before the party and place them in the refrigerator to begin thawing. You might like these other adorably cute black cat Halloween treats. Thanks so much. These flourless chocolate cakes are one of my absolute favorite desserts. I do hope you give them a try.